With NaNoWriMo fast approaching I have been plotting like a dragonish fiend. I’m a wholehearted plotter, peoples. I used to be a panster (a word here which means “writing-whatever-comes-with-no-direction-or-previous-planning”) but it absolutely stressed me out. I didn’t know what I was doing! Where I was going! WHAT EVEN THE POINT OF MY BOOK WAS. I wrote an entire book without a point because…pantsing. Sometimes I pet that novel and smile at it fondly. But mostly I toss it on the metaphorical bonfire and burn it with the fire of a thousand disappointed suns and then scream like I’ve been impaled by a pineapple frond. I learnt that I like to plot, okay? It is my thing. SO HOW DO YOU PLOT, CAIT? WHAT ARE YOUR PLOTTING SECRETS? This is an excellent question which I plan to answer. Furthermore, before you even start to read about my plotting process, I can give you the excellent news that — MY PROCESS IS DERANGED. I follow no methods. I download no printable outline sheets. Half of the reasons I do something is “because it looks pretty”. But you asked (actually you didn’t, but I know you wanted to ask…see how helpful I am?) and I am answering. TO BEGIN, I PLUCK ONE OF MY 9,083 BOOK IDEAS AND WRESTLE IT ONTO THE EXECUTIONER’S TABLE. I used to pick any idea that tickled my fancy. Now I am agented, I try to be a little more responsible and discuss and refine ideas with my agent. I’m a good moppet like that. Once I have a conglomeration of approved ideas, I then pick the shiniest one. Aaaaand it also depends on the time of the year. At the beginning of the year I’m 2948% more likely to write something happy and smushy. July saw me writing a contemporary where exactly no one died. October had me killing off several key members and bringing them back as zombies. November … well, everyone will die. Sorry. From anywhere. I know that’s a horrible answer BUT IT’S TRUE. I get many “what if” ideas from books I read or movies I watch. They never relate. For instance, when I saw The Eagle, I went off and wrote a sci-fi book that had no similarities in plot whatsoever…but. Somehow it happened?? I also get ideas from realising I want to read a certain kind of book and then can’t find one already written. So I write it. I am helpful for me, at least. SINCE IT’S NOVEMBER, I FEEL LIKE WRITING SOMETHING VICIOUS. SO DRAGONS IT IS. I BEGIN TO READ DRAGON BOOKS. This year, since my book is dragonish and Japanese, I’ve been reading Dragon Rider, A Dance with Dragons, Ink, and copious amounts of children’s history books on Japanese culture. NEXT I LIST A BILLION RANDOM THINGS I LIKE AND DECIDE HOW THEY FIT TOGETHER. Usually they don’t fit together. Which is disagreeable. BUT THAT DOESN’T STOP ME. I am queen of all here. These ideas will obey. This year I wanted dragons, and roadtrips, murder, and unreliable narrator, sushi, compulsive lying, epilepsy, dubious governments, and everything frozen (and if you dare sing Let it Go I will wrap you in a pancake and feed you to my dragons). Does this even count as “inspiration”?? My process of writing is like 30% inspiration and 70% things that interest me in that moment. I TRA LA LA AROUND LIKE A HOMELESS PENGUIN AND IMAGINE SCENES. This usually happens when I take my dog for a walk. Showers are also good for imaging. Also those hours when one is supposed to be sleeping. But PFFFT. You can sleep when you’re dead. I GET TITLES AND NAMES BECAUSE THEY ARE IMPORTANT TO ME. Titles technically don’t matter that much now…buuuut. I LIKE THEM. I also pick character names. This 100% depends on what names I’ve recently stumbled across and liked. I almost always have gender neutral names because it amuses me to have characters named Valentin and August and have no one know who is who. Mwahha haha ha. For this book I was DYING about the names! I couldn’t think of any I liked! I ended up using “Ruby” as a placeholder name and…it stuck. I also spent 2 months calling my main character Kinshi, but then changed it to Matsumoto Mo and felt much better. ONCE I HAVE THOSE SQUISHY SCENES IN MY HEAD — I WRITE A SYNOPSIS. I usually write 2,000-3,000 words! I outline scenes and basically have an outline of events. I definitely make sure I have a beginning and an ending. I make sure I have a VERY detailed middle because middles are easy to lose interest and decide to abandon authorhood and take up professional penguin training. If I get stuck? If the plot just isn’t coming? If I despair the plotting will ever come together? I JUST SIT DOWN AND WRITE OUT THAT SYNOPSIS. I can sacrifice every single step — but I must have that synopsis. This is new! I only just got Scrivener and…oh my gosh, humans. If you are an organisational freak like me — GET YOURSELF SCRIVENER. It’s glorious. Usually I’d dump everything onto a word doc, but now I can have little folders and folders inside folders inside folders. And excuse me, this is so beautiful to even type I need a moment to cry in happiness. Write character profiles: I’ll write out their names, their goals, their failings, their food obsessions. All that squishy stuff. 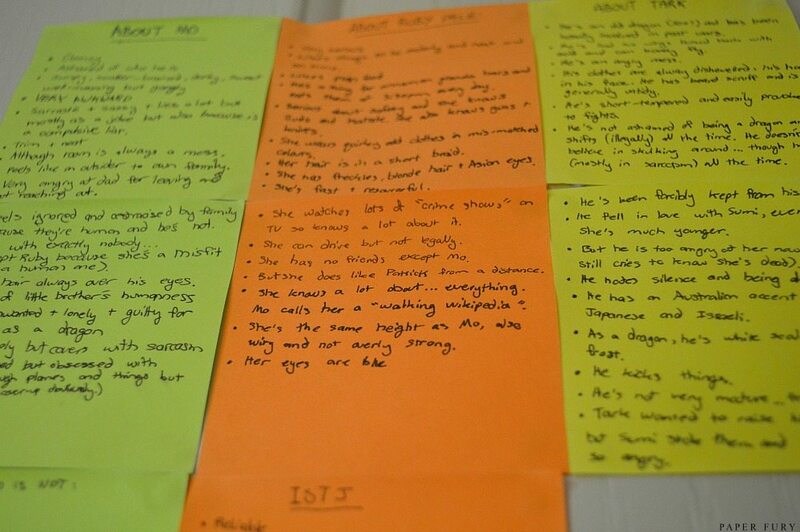 Sometimes I find their MTBI personality and I’ll go onto pinterest and see how an ISTJ functions. I’ll write down their habits according to that too, because IT IS SO HELPFUL. Characters are my failing. Do a little world-building: I don’t get too detailed, because first drafts are for exploring my own world. But I write about the culture, the currency, the important details about food. If I have magic, I make rules. I research the Weird Thing I’m obsessed with: like for this book I’m interested in Japan. So I take a tour on Youtube of a day in the life of someone in Japan. I google pictures of Japanese food. I get very hungry. I DO ALSO WRITE JOKES TO MYSELF, BECAUSE I’M HILARIOUS LIKE THAT. There is nothing like amusing oneself with jokes, okay? I am a highly funny individual and myself appreciates that. I ALSO USE MY WALL AS A VISUAL STORYBOARD BECAUSE THAT’S WHAT WALLS WERE INVENTED FOR. Some people hang paintings. I hang lists of characters I’m considering killing. (Oops?) 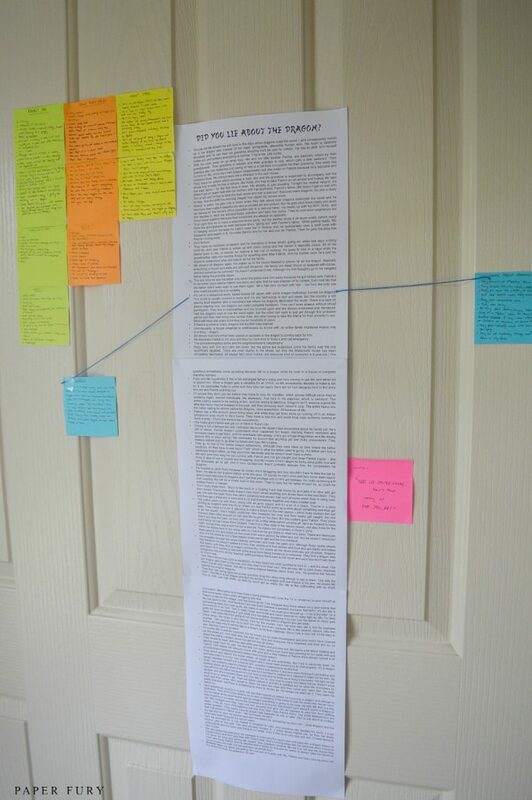 I love putting my outline on the wall because I have a HORRENDOUS memory. And this really helps me to remember where my story is going. I stand and stare at it and think of ceiling wax and dragon wings and it works for me so well. I’ll pin up quotes and character outlines and extra scenes I’ve made up. I turn it into a spider web Sherlock would be proud of. I PINTEREST AND NO SHAME, FOLKS. Pinterest can be a black hole of procrastination…it can also be hugely helpful if you’re a visual person. Also if you have face-blindness, like me, and can’t think of what your characters look like (bad for description!) it’s monstrously stupendous to find faces. MY HAPPINESS WHEN I FIND A FACE. THEN I PROCRASTINATE AND WAIT FOR AN AUSPICIOUS DAY TO START WRITING. THEN I WRITE WITHOUT BREATHING FOR 7 TO 10 DAYS. Because…writing is hard okay?! I have to psych myself up! I’m terrible and usually go “I’ll start on Monday” and if I miss that Monday — I DON’T START ON TUESDAY, BECAUSE NO. I WAIT FOR THE NEXT MONDAY. It’s bad, I tell you. But once I start, I write 8,000+ words a day. I usually write fast for a 7 to 10 days and don’t read or blog avidly. Everyone in the house forgets my name. My dog is forced to fry pancakes and bake lemon pudding for himself to survive. And then I emerge, exhausted and with numb fingers, and announce I wrote a glorious book that is so deathly hilarious and…I hate it. Like a good artist. There we have it! ALL MY SECRETS! My methods mostly depend on me having a) a very good imagination, and b) a very clear idea of where I want the story to go. I usually know when a book is ready to move to from imagining scenes to the synopsis stage. But it can be a few weeks…or over a year. I do almost everything by feel! Does it FEEL like a good time to write this book? Do I have enough concrete scenes? How many times can I get away with writing about assassins in one year?? All these questions are asked. Sometimes they’re answered. And then — I have a book. what’s your plotting process right?! are you a panster or plotter? what’s the most CRUCIAL part of your process??? do you do anything similar to me? LET US TALK ABOUT OUR METHODS IN THE COMMENTS!! I’m a plotter. I like to plot- somewhat. but I also like to see where things take me. I really like writing character arcs/ and backgrounds, whcih helps me a lot. I also struggle with where to put new chapters so I *try* to do that in the plotting process. Yes to the synopsis as well. Thanks for sharing your process and good luck for nano! I’m somewhere between plotter and pantser. I don’t plot in detail because it’s like being told what to do. But I still plan a few chapters ahead so I know where I’m going and I know the ending before I start writing. That little Lemony Snicket reference at the start might have made me squeal like a little girl. I don’t know if I have a real process. For my Fantasy book, it’s an idea that started almost ten years ago now. And it has changed so much since then! My very first version of Eternal Light was called The Fire Crystal and it was a wopping 40 pages in Word. Jep. But the essentials remained. The MC goes to a whole new world he never knew existed and elemental powers & dragons. Over the years I just got idea’s and wrote them down. Now that I have the real story, Eternal Light, I usually get idea’s or solutions to problems randomly and most of the time I get those right before I go to sleep. I don’t know, my brain works overtime when I lie in bed waiting for sleep to come. For my contemporary book, I just took a bunch of stuff from my own past and threw it in a blender. Then I added new stuff & changed some details and I mixed it up. Then I was listening to a song and that inspired me to change the POV. So pretty simple. For my third project, which is a paranormal story about revenge (it’s really dark), I got inspiration from a song. The lyrics spoke to me and I worked out a rough storyline from there. Your plotting process looks MUCH more complicated than mine. Normally, the plotting process begins when an idea assaults me enough that I start thinking about it ALL. THE. TIME. I begin noting down ideas in a document I call draft 0, and this normally takes a couple of months. Then I pick an auspicious date, much like you, and I used to do wall-planning but now I go for the more environmentally friendly option of powerpoint-planning. Pinterest is super important. I’m way less detailed than you, though, at least on paper, because it’s mostly in my head? I did have to plan a magic system, though, and I did it in a classic word doc like your printed stuff, and I even filmed myself doing it in my latest post. I’M SO EXCITED FOR NANO EEEEEP. You got Scrivener? I love it so much! I do my first draft in word so I can keep track of my word count easier than do all my editing in Scivener, plus all the character and setting stuff. But, unlike you, I cannot plot a book to save my life. I end up veering off the outline because my characters and plots like to do their own thing and the outline is basically ignored. I wish I could outline; it would make writing that much easier. BUT I JUST CAN’t. Your writing is absolutely glorious my friend. I laughed so many times. Plotter all the way. I pantsed (totally a word) NaNoWriMo last year and it was the biggest mistake of my life. At 25,000 words I was literally inventing problems to stretch it out because I had a start point, and characters, and a world, but nowhere to go. I think they changed their minds about where they were going about six billion times and every time they had to re-cross the world. I’m sort of an incredible mixture of plotter and panster but I’m trying my best to shift my full focus to the former. It’s hard. But I’m trying. I love writing character acrs as well and thank you for the glorious amounts of tips, specially the synopsis thingy, I’m definitely going to use this process from now onwards. This is actually pretty awesome! And your novel sounds great! I really like your planning process. Why is the synopsis so important? Also your Sherlock gifs were on point. Research sounds hard. What’s the most interesting thing you learned? Which was the most boring research book? Dragons!!! High five. I’m writing dragons too. Thanks for your insight – I’ve always been a pantser but I’ve learnt over the past year that writing a fantasy as a pantser is not a good idea. But I hate plotting – I’ve written out a summary (sort of) of what I want to happen, I know all the major players (but haven’t done a full character bio for them), and kind written out important scenes, but that’s about it. I do find pinterest useful though, and I have specific pins that go with specific scenes so I’m hoping to use those to “get the juices flowing”. I was sort of scared of Scrivener, but it really isn’t TOO bad if one is willing to just click on all the things and see what they do. xD Ohh, I’ve heard of Evernote but never looked it up. I SHALL DO THAT. So, what exactly is NANOWRIMO because it sounds quite interesting and I am fully intrigued after reading your post…even though it wasn’t technically about that. Your plotting is perfect and I wish that I was organized like you. I would be all over the place and wouldn’t know what to do. I would be so overwhelmed so now I will be using some of your ideas to help me…if I do decide to possibly start writing. I can’t wait to see even more of your books because every idea you come up with, Cait, is marvelous. I’m a planster. I plan, extensively, but I never write anything down until I actually write the book, so I can keep a loose hand on my plot and let it surprise me. Life is dull if your writing can’t surprise you. Um, like you, most of my ideas come from “what if” questions, or the realization of “Why has no one written a story like this. Oh, wait. I’m an author. Let me proceed.” And like you, my collection of ideas that I string together usually have no business being together. But I make them work. Also, I find character names and titles to be of the utmost importance. I can’t write a book unless it has a proper title. I’m incapable of it. But I’d say the most crucial points in my plotting process are determining the key points of the story: The beginning, climax/ending, and any mid-goals. mid-goals are what I call mini-climaxes that I hit in the middle of the book. Some of my longer books may have more than one. Anyway, I need this islands so I can know what I’m working from, and working towards. Ohh, you must have a good memory then. xD I can think up an epic scene and then 2 days later it’s totally gone unless I write down the basic jist of it. -_- I’m never bored and I have everything plotted out. 😛 Hehe. I think it’s important for a writer just to do what works best for them, right?!? *nods* I’m glad I tried pansting, but I’m also glad I discovered I like plotting waaaay better. YES TITLES ARE IMPORTANT. I literally can’t do a draft without one!! Sounds like you have a great plan! I’m actually a panster who tries to be more of planner, but I usually fail. I’ll have to try some of the things you have here. Everyone loves Scrivner apparently. I’ve tried it before but it was just too much for me. It didn’t really make sense. 🙁 Oh well. I think it’s important to do what works best for you, right?!? Like sometimes I feel to lazy to do plotting, but I always regret it. xD SO. I do it. And I kind of love the process of putting a plotting mind-map on my wall. :’) I’M DOING A POST ABOUT SCRIVENER SOON!! AHHH WE CLEARLY ARE PARTICULARLY FABULOUS THEN, AMIRITE?! The jokes are the best part of reading back through my outline. :’) Your sister is wise. Always listen to sisters. YAYYYY FOR ANOTHER PLOTTER!! *gives you a covert plotter hi five* And isn’t it totally relaxing writing when you know where it’s going?! I feel like I can churn out thousands of words per day because I KNOW what’s coming next and I don’t have to pause for writers block. SO NICE. I’m… well, I’m terrible at plotting. I always have a beginning and an end, but never a middle., and you kind of need that in a book. Middles are SCARY. 0_0 I always do intense things in the middles of my books because, as a reader, I usually am bored by that time. 😛 Or just fill the middle of your book with scenes of them eating delicious food. Insta win. This is a great post! I always love to see how others plan. Personally, I’m a pantser with a very loose outline – kind of like a mix of both. I start my ideas with things/tropes I like (space, pirates, magic, whatever) and then go from there. I also find a lot of my inspiration from random stuff on Pinterest, languages and weird linguistic stuff, and historical events. I really like to think of story lines right before I go to bed so I can write them down and think about it in the morning with a fresh eye. And then I just start writing once I have about eight steps with where to take the story! It takes more revision, but it keeps the blank pages away. Pinterest is like HEAVEN for random bits of inspiration right!? I LOVE IT. I probably would die a bit plotting without it. xD I love the sound of your process too!! 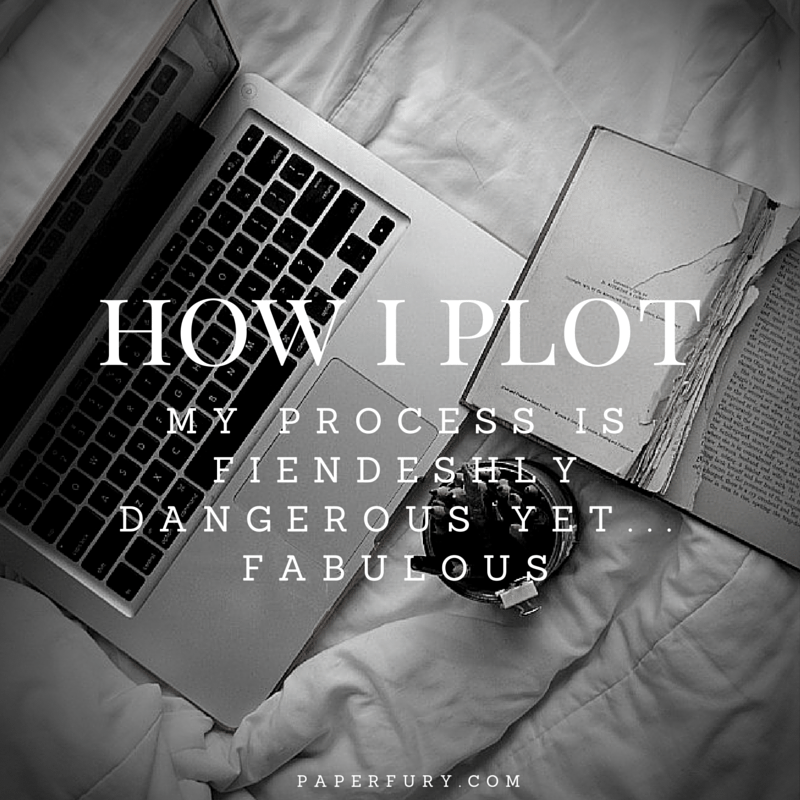 I am a full blown plotter for a full blown plotter (ok, a bit of an exaggeration, but my favorite part of the whole writing process is the plotting part). Usually when I get an idea, I grab the closest piece of paper and start jotting down plot points and possible ways the story could go. Once I’m sure I have a good plot, I break it up into scenes and start to think of setting and stuff, but not that much. I world build as I write, meaning if my protag could use a giant Scottish caterpillar, I give them a giant Scottish caterpillar (who then eats them for breakfast). the very last step, right before I start to write, is naming my characters, who in my current WIP’s I change after the first draft since they don’t sound like they’re from a German based world. and OMG I IMAGINE SCENES WHILE I SLEEP TOO!!!!!!!!!!!!!!!!!!!!!!! It is the best! Even if I don’t fall asleep for an extra hour but so what? SLEEP IS FOR THE WEAK. WE ARE STRONG WRITERS WITH IMAGINATIONS. HUZZAH! This is probably the LEAST deranged you’ll ever be, Cait. My writing method: let the idea stew around in my brain for several months. Then, a week before NaNoWriMo, realise that NANOWRIMO IS COMING UP SOON and then write all of the scenes down. I don’t write a synopsis because ew. I have about 50 scenes and I’ll probably not pay attention to them at all. It’s a fun time. PROBABLY. *nods* Because I’m not even writing straight on the walls yet. So I think there’s still hope for me being a normal person. I LOVE your writing posts 😀 they’re always funny and awesome and it’s nice to see how other people write! I don’t do outlines but before I write my story I usually have a general idea as to where it’s going. When I’m writing I create a powerpoint with all the character’s, their stories, their age…ect. I also include the plot, things I want to include, stuff like that 😀 BUT I LOVE you wall idea, I think that’s so cool! Cait, Cait, Cait! I need a publishing house to publish you because I want to read your books … SO BADLY. I am also like amazingly astounded at your awesomeness of plotting and your honesty about the entire thing. Personally, plotting is my favourite time of writing because staring at walls and writing snippets of dialogues and obsessing over character names is pure joy for me. I have no proper process thought (partially because I still consider myself a newbie to this whole writing not as a hobby but seriously thing) but I know I love my imagination and I try to force myself to write outlines because I admit it is easier to write with them. Also I totally relate to writing about random things you love and put together and YAY! for plotting on walls (which I would totally do except my parents have a understandable thing about blu-tac peeling paint off the walls … absolutely understandable, I think, but still …). This is pretty awesome! 😀 I admire your abilities of detailed outlining and then super fast writing. My process has morphed a lot. I’m slowly becoming something of a plantser. I like having a good idea of what I’m doing but still leaving it loose enough that I can take detours. Ahh, yes!! Letting one’s process morph and change and grow is super good too. *nods* Because, honestly, 2 years ago? I was a complete panster. 0_0 And I wondered why I spent so much time crying and hating my writing. xD I’m a firm believer in trying out ALL THE THINGS so one knows what works best for them. AWW THANK YOU. <3 I shall go read it now!! Hey wow, it’s nice to know somebody else writes jokes to themselves! All the notes I wrote for my stories are full of amusement and just as interesting to read through the second time because of all the insane little useless tidbits I add… typically bitterly comparing my villain with someone from TV I currently hate, or explaining a situation with song lyrics, or just being like “Haha, as if he’s not just as mentally insane as she is” (yes that is an actual thing I have done). I also draw pictures. Sometimes they involve the story, and sometimes they involve… everything but… the story. Eheh. *hi fives for private jokes* I have like this interior monologue going about my own book, like “Plot point #23: they run away [haha like that’ll work out]”. AT LEAST WE AMUSE OURSELVES, RIGHT!?? Oh, Cait, planning. You’re so cute. Let me explain how things work for me. Step One: Have a (rare, very rare) idea that may not actually be a dead end. Write it down, because otherwise, it will vanish from my mind forever. Spend several days trying to remember what it was and where I wrote it down. Step Two: Think about the characters. This is easy for me. I love to create characters, apparently. In my head, of course. Only in my head. Step Three: Realize I have no real plot, other than whatever that first thing to pop into my head was. Where is this story going? No idea. How is it supposed to end? You got me! This is the point where I weep in a corner. Step Four: Decide to try to write anyway. Spend an hour doing so, feel super proud. Realize I am now behind on everything else and panic. BAH. SHANNON. YOU’RE ADORABLE. XD You know it’s okay to take breaks from ALL the things and just focus on one thing for a while, don’t you?! I AM JUST SAYIN’… But zomg, I particularly like step 2. Me. Me exactly. Except me doesn’t even think up the characters. Me just thinks up a personality type and gives it a name and pretends its actually a human. HALP I CAN’T CHARACTER. Yes, I put my stuff up on my wall, too!!! I call it my Wall of Utter Procrastination because you could look at that thing forever and not get bored. (Not only do I stick up my plots, characters, timelines, etc. but origami, quotes, French verbs, posters, a world map… the list goes on.) Plus my family thinks I’m insane, but whatever. Thanks for sharing your writing process! Oh, Cait – I so love all of this. I think I need to take your advice here because I tried writing my NaNo book without plotting last year, and it was … just … well … plotless. I LOVE the characters and I think I have a solid idea, but the plot just didn’t go much of anywhere. I’m not giving up on it yet – I’m still planning to wrestle the book into submission, but I realized I needed to do some serious plotting and then give it another go. We shall see! I don’t know what Scrivener is! I will have to look it up. Haha. XD We have similarities to our writing process. I’m a plonster (a mix between plotter and panster). I plan out my books roughly before I write them then dive in, though I’m not as speedy as you are. It usually takes me roughly two months to write a draft. And Scrivener is the best. Just sayin’. AHHH I WANT TO CONVERT EVERYONE TO SCRIVENER NOW. XD Well. Not everyone. hehe, but I’m going to write a post on why it’s so good!! I love this post and I love seeing your process. I am so incredibly organized so I LOVE the look of Scrivener. Since this is my first NaNoWriMo and I just decided to do this like two weeks ago, I am just seeing what happens. I am terrified that I will get writer’s block after 5,000 words. I am trying to do a mix of organization and pantsing (just learned that term myself, haha). I want to have a clear idea of where I am starting and where I am ending and plenty of scenes in the middle. But I don’t want to plan every little detail and then feel stuck. I guess I will see how well everything works after this month is over. Am totally not a planner I have the ideas. However I can’t always put them on paper and though am doing NaNo this year I’ll be going into it somewhat blind. Wish me luck lol. GOOD LUCK!!! And there’s nothing wrong with that. 😛 I know toooons of writers who just go in and see where the story takes them. It’s probably more exciting for you that way, right!? I love reading these posts in general, but know that I’m ACTUALLY planning to write a book and not just saying it, they’re also really helpful! Plus there are pretty pictures of colorful notes, so that’s a win anyway. I’m a complete pantser, and I basically know nothing about my story before I write it, but that has lead to me getting stuck and demotivated in the past, so I’m trying to find a good middleground now. I can’t plan out everything, because if I already KNOW everything, then where’s the fun in writing it? I’m also terrible with coming up with ANYTHING in advance, so that’s a problem. But I do usually get vague ideas when I actually start writing, and I have a chapter or two for my NaNo novel, so I’m actually trying to do a veryyy vague outline. A day before NaNo starts. I guess I’m definitely still a pantser haha. I never would have a done a synopsis, but since the NaNo site asked for one when I created my novel, I did it, and it’s actually really helpful! I also just downloaded the Scrivener trial version after reading this, because it looks quite handy. Let’s see whether I can figure out how to use it before tomorrow! YAYYYY I AM SO SO GLAD, VLORA!! 😀 *flails quietly in the background* aHEM. And it’s visually nice to look at when one’s book is plotted across the wall, right? I lie in bed and stare at my cupboard doors of books plots and feel very accomplished. Bad news is I ran out of wlal space. NO MORE WRITING FOR ME. Omg, how did you go with Scrivener?!? I’m loving it! It’s so useful for referencing other documents without having to open 10.934 windows and it saves everything right away and just ASDKJFLJA IT’S GREAT. I think I’m definitely going to buy it after NaNo, thanks! Let’s have three cheers for showers and dog-walking! My best ideas always come when I’m getting ready for the day, which usually means I’m running around at 10:30 in a bathrobe with my hair up in a towel and papers flying everywhere. You are so much more organized than I am. xD I wish I had the patience to set up all of those wall maps, but in reality my notes are all in one file and half of it doesn’t make any sense by the time I go to reference it. But maybe Scrivener can cure me of that . . .
Names and titles, yes! Those are my favorite parts of starting a new story, OMG. I am mildly obsessed with names. I currently have over 300 of them written down to use at some point. But it depends on what kind of writer you are, right??! Like there’s no point forcing yourself to do a method that doesn’t suit you, right?! I am a details and plotter person. XD IT MADE SCRIVENER MY LIFE. I don’t really have enough wall space in my room to do the wall-taping thing but I have to admit it’s really tempting to take over the living room over winter break >> That’s when I’m doing my plotting for the current novel I’m working on, and having a large amount of space would be ideal. DO you think taping things to bookshelves would work? This is actually really interesting! I’m still trying to figure out how much plotting works for me. I can’t do pantsing, it stresses me and I get stuck sooo much. But sometimes I get tired of trying to come up with an entire plot and skip sections and then…ooooh it doesn’t go so well. SIGH. BUT sometimes I’ll be writing along and then something wonderful just happens and I didn’t plan it whatsoever. I DON’T EVEN KNOW OKAY. 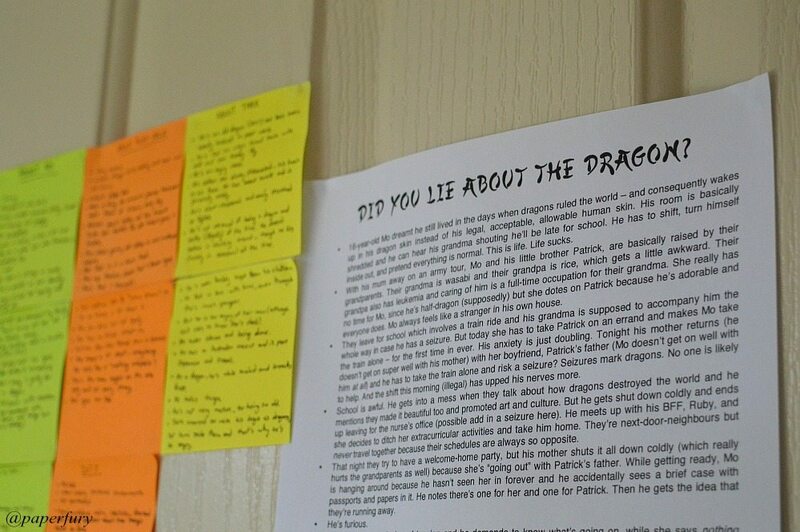 You know, I may just have to try putting those sticky notes on the wall and just staring at them. The visualisation is something I haven’t tried before — mostly because I’m lazy — but it would be very motivational. Maybe because you’re forced to stare at them while they keep reminding you that you still haven’t written a single word. Doooo iiiiit. I have mine so I can lie in bed and stare at the wall and it’s all pretty and colourful and IT’S LIKE MY BOOK IS ON THE WALL. It’s actually really inspiring. Also makes me feel like Sherlock so #bonus. You make me want to write again! The process feels so hard when there’s so much in your head and you just don’t know how to translate it all to paper. For the one novel I’m writing, I have, like, three timelines, a notebook, and a ton of scraps of paper dedicated to “organization.” Maybe the next book I’ll write from beginning to end instead of writing what I feel like. But maybe I should finish this one even if I don’t plan to use it! Maybe even if it’s not good enough to want to publish, I can look back fondly at my first completed attempt. But I’m blathering now- literally typing these thoughts as they come to me. Haha, I’m tired. Bedtime! Thanks, Cait! I think I’ll give it a shot! As always, Cait, your writing skills are flabbergasting and entertaining! YOU DO SO MANY DETAILS! I like that you do so many details, but I never do details when I plot because if I write all the details my brain thinks it has already written a book and then it refuses to write any actual drafts. You can imagine many awesome ideas have faced a tragic end because of this. 🙁 Also I have to say I like all the colors and spacial elements you use so that you are touching your story on paper before you type it all up on the computer. That, I think, is super cool. Also: “homeless penguin.” XDDDD Me gusta. It is super cool to lie in bed and stare at my "book" on the wall. IT'S INSPIRING. OH OH OH I HAVE BEEN WAITING FOR THIS POST! *I do. I am an instruction reader. This diving-in-without-doing-the-Scrivener-tutorial is against my basic instinct. I never jump into anything unprepared. GAH NaNo is making me do weird things! I’m still trying to figure out my ideal plotting method, but right now it involves a lot of scribbles on a lot of papers with a lot of confusing arrows. Also post its. I’m never happy with my first draft words. 😛 I only start to get happy after 2nd drafts. XD And I’m okay with that process!! Omg post-its. <3 They make plotting so much better. OH MY GOODNESS ALL THE SHERLOCK GIFS! Okay, I am rational. I am calm now. I’m not here commenting, okay? I am studying for an essay. . .
“You can sleep when you’re dead.”– Who needs sleep? Writing ideas wait for no sleeper! So much truth. I’m kind of a mixture of a pantser and a plotter. I usually pants through most things. But if my idea is on hold, I tend to plot/mental write. But usually my plotting consists of random, diabolical scenes, a load of world-building, eh. . . and scattered tidbits of hilarious/devastating (or so I deluded myself) dialogue that I have no idea where to place in the novel. OMG THAT IS GRAND NEWS, RACHEL!! <3 I hope you do start writing something. I feel like intense bookworms make EXCELLENT writers because every book we read is practise and research, right?! LOVED reading this! I love how you said you get your ideas from everywhere! That happens to me too! I’ll watch something and then get a random idea from it that in no way relates to what I just watched. I also find my best novel thinking happens when I’m showering and driving at night. I love this post! Adore it, actually. 🙂 (I was literally singing Let it Go, FYI) I always love hearing about how plotters work, because I am totally a panster. Oops? Currently I’m not a huge writer, so that may be why, but I definitely want to be more serious about it soon. Well, thank you! I do love cake crumbs of happiness… 😀 But I want to be a plotter, it’s just… (SO HARD) and it always ends up sounding really forced…. Now I must look this “scrivener” up and download it!! Thanks for this! I read your I-Finished-Nano-in-Four-Days post, and by the end of it, I was curious who you planned out a novel well enough (or at all) to crank out 50,000+ words in four days. I really like this approach and perhaps I’ll take a stab at it. I’m definitely not a pantser– I don’t like going in to projects blind at all. But, all other outlining approaches, with their grids and worksheets, seem so limiting. I especially love the idea of writing down a list of everything you like at the moment and figuring out how they are all related AND reading all the books that have already been written about the subject you want to write about. I’m curious though, how do you manage to keep your writing free from the influence of the books that you’ve just read? Ooh, thanks for reading this post too, Jackie!! 😀 *flails* But that is an excellent question….omg, let me see. WELL. I’ve been writing for a while and I definitely can see my earlier projects are heavily influenced by what I read/saw/watched more. Now? I let things inspire me and influence me, but I make sure to keep it ME. Because there’s nothing really new, right? So I wanted dragons (they’ve been done a million times) and murder mysteries (there are a zillion of those) and the combining them with my own style and flair and a roadtrip vibe and things…I just hope it feels distinctly ME at the end. hehe. But I do let other books influence me! Like reading Seraphina ALWAYS made me want to write shape-shifting dragons. But I made mine modern instead of medieval. If that makes sense. As a non-writer I find this post very interesting. I love your wall as a visual storyboard, I’m a very visual person, so I’m with you on it and on using Pinterest. I’m a panster, but I LOVE writing down remote details of the world that I’m writing THAT WILL NOT AFFECT THE STORY AT ALL. It’s bad. I write synopsis, do character plots with lots of details, but I DON’T PLOT THE STORY. It’s really bad, because I’ll get half way through, and get stuck, OR I’ll write, and I won’t get stuck, but because I don’t have a set plot, the story will change so much that when I go to edit, it’s like 50 hurricanes went through the story and messed all the words up. 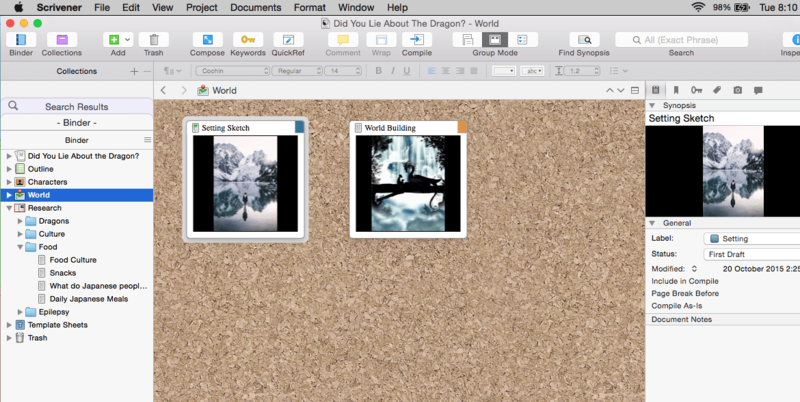 Everybody I know who writes uses Pintrest for their story boards…….and then there’s me, who makes story boards with music…..
Ahhhh, plotting IS a challenge, isn’t it?!? 😂 I used to be a panster!! It definitely didn’t work out for me and I used to get stuck a lot, bleh. I really hate writers block, and I find plotting in a lot of detail helps avoid that? WHICH IS AWESOME. 😂 But whatever works best for us right?! So don’t feel pressured to plot if you don’t like to! I love the idea of putting it all up on the wall but my parents would kill me so.